The Grim Reaper's favourite chocolate is now available. Choose from three different versions, each of which is packed full of delicious chocolate and chilli in the form of Naga Jolokia. You'll soon curse us to the deepest *ell because we dare to offer this Chilli Chocolate by Grim Reaper Foods to mere mortals. Because, the fact is you can't make up your mind which to eat first! We ourselves leave the milk chocolate last since it's the hottest variant. 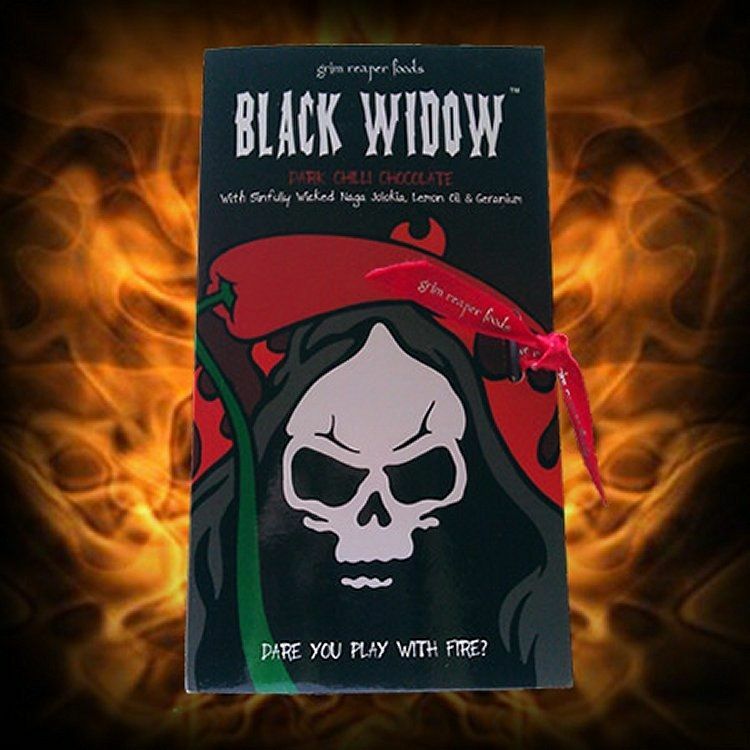 Another option is to search the deeps of the soul with the Black Widow dark chocolate. And last but not least, you can sharpen your senses and let the white chocolate, spiced with Naga Jolokia, do its thing. 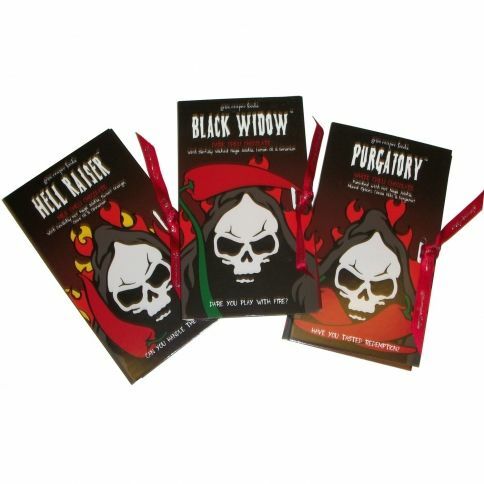 Jokes aside, these chocolate bars, hand made in Britain, look truly great including the packaging, and each and every one is packed with hotness appreciated by chili heads. The looks hint well what to expect. So, every variant includes chilli as an ingredient, and they combine hotness and great chocolate tastes in a harmonius manner. This sinfull bar includes Naga Jolokia, citrus oil, and geranium. Dark chocolate: sugar, cocoa butter, cocoa paste (73%), soy lecithin, natural vanilla, citrus oil, geranium oil, Naga Jolokia (0.1%). Compatible with vegetarian diets. Gluten-free. Please note: includes soy. This bar is punished with Naga Jolokia, a spice mixture, cocoa, and Bergamot extract. White chocolate: sugar, cocoa butter, milk powder, cocoa paste (28%), soy lecithin, natural vanilla, cocoa, bergamot oil, spices, Naga Jolokia (0.3%). Compatible with vegetarian diets. Gluten-free. Please note: includes milk products and soy. Devilishly hot Naga Jolokia, sweet orange, clove oil, and cinnamon. Milk chocolate: sugar, cocoa butter, milk powder, cocoa paste (36%), soy lecithin, natural vanilla, orange oil, cinnamon, clove oil, Naga Jolokia (0.5%). Compatible with vegetarian diets. Gluten-free. Please note: includes milk products and soy.